Kerry's comments are in line with previous reporting on his behind-the-scenes attempts to save the nuclear deal and ensure that Iran continues receiving billions in cash windfalls. These payments were brought to a halt by the Trump administration when it abandoned the nuclear agreement and reimposed harsh sanctions on Iran that have nearly toppled its economy and sparked a popular revolution. 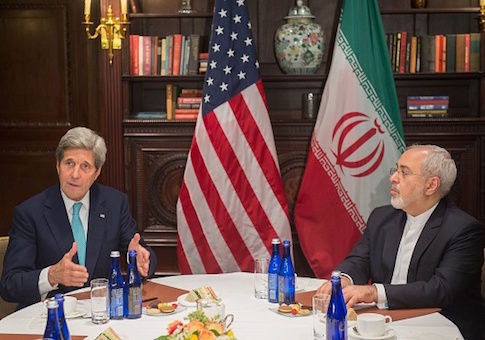 Kerry said he met Zarif in Norway, Munich, and other international forums. As Iran continues to plot terror attacks across the globe and transport weapons to regional hotspots in Syria and Yemen, Kerry has tried to help Zarif preserve the nuclear agreement with European nations. "What I have done is try to elicit from him [Zarif] what Iran might be willing to do to change the dynamic of the Middle East for the better," Kerry said. "How does one resolve Yemen, what do you do to try and get peace in Syria? Those are the things that really are preoccupying him because those are the impediments to Iran's ability to convince people its ready to embrace something different." Kerry said he has offered blunt talk to Zarif in order to push the regime to accept restrictions on its foreign interventionism. "I've been very blunt to Foreign Minister Zarif. I told him, ‘Look, you guys need to recognize the world does not appreciate what's happening with missiles, what's happening with Hezbollah, what's happening with Yemen,'" Kerry recounted. "You're supporting an ongoing struggle there." Iran has said "they're prepared to negotiate and resolve these issues, but the [Trump] administration's taken a very different tact." Criticizing the current White House, Kerry lamented that "it appears right now, as if the administration is hell-bent … to pursue a regime change strategy" in Iran that would "bring the economy down and try to isolate further." The former secretary of state cautioned the current administration, saying "the United States historically has not had a great record in regime change strategies, number one, and number two that makes it very difficult, if not impossible, for any Iranian leader to sit down and negotiate anything because they're not going to do it in a capitulatory situation." Iranian leaders have said multiple times in recent months that they will not take any meetings with Trump or his administration. This entry was posted in National Security and tagged Iran, Iran Nuclear Deal, John Kerry. Bookmark the permalink.